There are a number of taxi Schiphol services you can choose from. These range from grabbing a taxi on the street, to visiting one of the city's or airport's taxi ranks, or even booking a cab online or by texting (SMS). A taxi journey to or from Schiphol should take roughly 25-30 minutes. The frequent traffic jams in Amsterdam can extend this considerably. A cost of roughly 45 is average for the trip between Amsterdam and Schiphol. Taxis in Amsterdam charge via a meter which is visible to the passenger. This meter does not increase the fare when the taxi is standing still, so traffic jams shouldn't be too much of a problem, unless you are cutting it fine to make your flight of course. One common option is to ask your hotel to book a taxi for you. Taxis collecting from a hotel call are not allowed to charge any additional fees on top of the metered charge. Schiphol Travel Taxi is the Dutch national taxi service for airport transportation. This is a very convenient option, offering transportation to and from any airport in the Netherlands, 24/7. Travel Taxi Schiphol will pick you up from any address in the country, so collection from your hotel should not prove a problem. Travel Taxi will drop you to Schiphol Plaza, the central airport hall. The Travel Taxi service guarantees availability up to 48 hours before departure and allows booking online, via the Schiphol website at www.schiphol.nl or by phone on 0900-8876. From outside the Netherlands you should dial +31-38-3394768. Fees with Travel Taxi Schiphol are on a fixed rate, which depends on whether you wish a private or shared taxi, the amount of people travelling, the amount of luggage and the length of the journey. For online transactions you can pay with a credit card or even a debit card, if you are not planning to travel within 6 days. 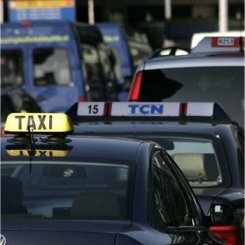 The largest and most established taxi company in Amsterdam, Taxi Centrale offers fixed rates to Schiphol at the average rate of EUR 42. You can contact this 24/7 taxi service by phone at +31-20-7777777 or online at www.tcataxi.nl. Within the Netherlands, you can even use their text service (SMS), texting 2255; a return text will inform you of the time of pick-up and even the number of the taxi. As well as the major public locations like Centraal Station and Leidseplein, Taxi Centrale ranks can be found in front of many major hotels. Look for the company's distinctive black and red taxi signs. There are many sites offering dedicated taxi Schiphol services. While not all of these are as established as the ones above, it never hurts to have options, particularly during Amsterdam's busy tourist season. Taxibus Schiphol offers private Mercedes Benz and Chrysler taxis for those who wish to travel in style. These cabs are exclusively private and are aimed at business travellers. Book online at www.taxibus-schiphol.nl or call +31-20-7775547. Schiphol Taxi Reservation offers choice for both business and private travellers in luxury cars or minivans for groups of up to 8 people. These taxis are also private and can be booked online at www.taxireservering.nl or by phone at 0031 65 5703069. One great feature of this site is that it calculates the price as you put in your details on the website, making it easy to see how much a particular trip will set you back. While most companies offer a fixed rate service, this may work out more expensive than a metered taxi. No matter which taxi Schiphol service you use, always ask the price in advance and make sure that it is not unreasonable before booking. If you just want to grab a taxi on the street, there are taxi ranks outside Centraal Station, the bus station at the junction of Kinkerstraat and Marnixstraat, Rembrandtplein, Nieuwmarkt and Leidseplein. Alternatively you can try to flag one down, but in Amsterdam this can prove frustrating as, outside of the ranks, it can be pretty hard to spot an available cab. Typically, you'll have to go to a taxi rank, or call one. Traveling to Schiphol by taxi can be very convenient, but it is necessarily quite expensive. Amsterdam has above average public transport and the main taxi Schiphol alternatives of train and bus can be worth looking into. The train from Amsterdam Centraal leaves roughly every ten minutes from platforms 15 and 14a, at the back of the station, connecting with the platforms beneath Schiphol Airport. A single ticket costs you about 4 and can be bought from one of the many yellow-blue ticket machines in the station or the airport. There are also a number of bus lines connecting Amsterdam and Schiphol. Traveling by bus should let you off at the same place as travel by taxi, Schiphol Plaza. Bus fares should be at least as low as train fares and passengers can use the Zuidtanger Line 300 to Amsterdam Zuidoost, Line 310 to Amsterdam Buitenveldert or the Interliner Line 370 to Leidseplein. 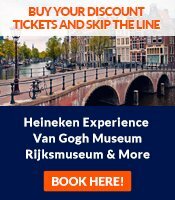 How to find cheap flights to Amsterdam?